Gov. Tom Wolf of Pennsylvania summed up his climate plan as "the quieter the better" in a face-to-face meeting with billionaire activist Tom Steyer in 2017, according to emails from a source with knowledge of the meeting. The emails also show Wolf worried that jumping into a state-based climate "alliance" after Trump withdrew from the Paris climate accord would "have a negative effect in his state." The emails were obtained in an open records request by E&E Legal, a nonprofit focused on energy and environmental legal issues, and the Competitive Enterprise Institute, a free-market think tank. The state's coal mining industry has been hit hard over the last decade, and helping employees affected by the downturn has continued to be a political issue, as evidenced by the recent special congressional election. Steyer and Gov. Wolf's meeting came about six weeks after a Rose Garden speech in which President Trump announced he was pulling the United States out of the Paris Climate Treaty. Emails between members of Steyer's NextGen Climate America nonprofit, and a staffer in the office of Washington Gov. Jay Inslee show that NextGen Climate America was a key driver behind the scenes in organizing state and local officials in reaction to Trump's Paris decision. "In regards to Pennsylvania, Tom [Steyer] sat down the [sic] Governor Wolf this morning to make the ask, and Wolf is pretty adamant about not joining," Aaron Burgess of NextGen America said in an email. "It is his view that it will have a negative effect in his state as the bigger deal he makes about it, the more the [legislature] will come after him. Basically his climate plan is ‘the quieter the better.' We are rethinking our PA strategy today, and will be on the phone with come [sic] environmental partners in the state his afternoon." "Bottom line: Wolf is not ready to join any event at [National Governor's Association] on this," Burgess concluded. A spokesman for Wolf defended the governor's rejection of Steyer's coalition. "Gov. Wolf takes a balanced approach to energy and the environment by helping the sector grow while also protecting the environment," said J.J. Abbott, Gov. Wolf's spokesman. "Energy development—from solar to natural gas—has increased in Pennsylvania under Gov. Wolf even while emissions have steadily decreased. Gov. Wolf believes Pennsylvania must do more to mitigate the effects of climate change but it must be solutions tailored to fit Pennsylvania." Abbot did not answer questions as to whether the emails were accurate representations of the meeting between the governor and Steyer. Representatives from NextGen America also declined to comment. "I'm curious how Wolf is proceeding in a way designed to avoid triggering the unwanted scrutiny of elected representatives," said Chris Horner, who orchestrated the open records requests for CEI and E&E Legal that pried open the information. "Because that's clearly what he seeks to avoid." Calendar records, which Gov. Wolf publishes online every week, failed to have Steyer's name on the schedule, instead referring to it as a "political meeting." Horner says he believes the calendar entry shows the Wolf administration is talking out of "both sides of its mouth." "Out of one side are the lofty transparency claims," he told the Washington Free Beacon by email. "Out of the other side, it misleads the public by withholding the apparently secretive, ‘deliberative' details of with whom the Governor met—the party's biggest donor, whose agenda he obviously needs to avoid not openly associating himself—and why. "However I do grant that, at least on the particular detail of this being a ‘political meeting,' I can't imagine anything more honest," Horner concluded. Steyer used NextGen in 2014 to go on the offensive on behalf of the Wolf campaign, launching television ads against Republican Gov. Tom Corbett that accused the incumbent of being beholden to oil and gas interests. The Washington Post's Phillip Bump openly wondered why Steyer was pouring money into a race in which Wolf was leading by 19 percentage points at the time. "Nineteen percent!" Bump wrote. "Why is NextGen/Steyer worried about carrying Democrat Tom Wolf over the finish line of a gubernatorial race in Pennsylvania, when he's up by 19 percent? Especially when there are a slew of Senate races that could ensure that Democrats keep the Senate, a top priority of the party?" Later in the same article, Bump answered his own question, writing, "Why? Because what NextGen wants to do, it's safe to assume, is make elected officials fear them. The political inertia on climate change is due, in part, to the fact that voters aren't energized on the topic … and therefore aren't putting pressure on elected officials to take action. What the environmental movement has been very bad at is the sort of electoral hardball that would get politicians without that political pressure." Steyer now has more national recognition for his "Need to Impeach" campaign, which includes television ads featuring the billionaire himself. His core political goals have become more difficult to ascertain with the "Impeach" campaign and a major political donation strategy aimed at helping Democrats retake the majority in the House of Representatives. At a recent "Need to Impeach" town hall in Arlington, Va., climate change was noticeable for its absence, as it was not even discussed in the first 90 minutes. 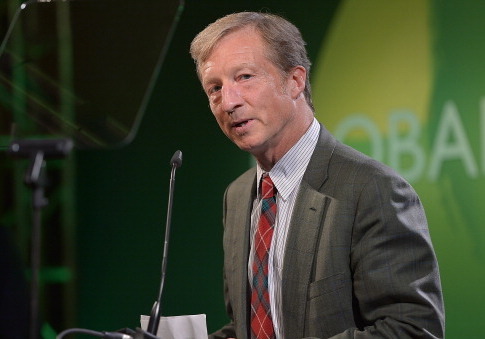 However, Steyer and NextGen are simultaneously pushing for an ambitious renewable energy standard in Arizona that has seen pushback from both Republicans and Democrats in the state, and NextGen appears to be interested in state races in New Mexico, Colorado, and Nevada that, if victorious, could set the table for aggressive climate and environmental legislation in the coming years. This entry was posted in Issues and tagged Climate Change, Paris Climate Accords, Pennsylvania, Tom Steyer. Bookmark the permalink.